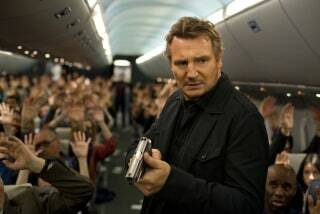 When did Liam Neeson, that Oscar-nominated rock of an Irish actor who starred in Schindler’s List and Michael Collins, become the toughest action hero of the day? When actors pass 50 they generally transition into, let’s say, less physically demanding roles. You know, fathers and mentors and sturdy authority figures offering sage advice to the younger folk doing all the running around. But at age 55, Neeson took the lead in Taken as a retired special agent who cuts a violent swath through the French underworld to find his kidnapped daughter. He’s since led The A-Team, battled a pack of wolves in The Grey, and gone continental badass again in Unknown and Taken 2. It turns out that old dogs can indeed learn new tricks and this month he’s got competition. While he takes on hijackers in a transatlantic flight in Non-Stop, a title that could just as easily describe Neeson’s reinvigorated career, Kevin Costner heads back into the field as a veteran Secret Service agent on the trail of a terrorist in 3 Days to Kill.